This article is about the Type. For other uses, see Warrior (disambiguation). Warrior (戦（せん）士（し） Senshi) is a diverse, versatile, and popular Type of Monster Card. There are Warriors of every Attribute, primarily EARTH, DARK and LIGHT. The Warrior-Type is the most human-like Type of monster, consisting of many human knights, brawlers, rogues, etc. The members of the "Amazoness", "Battlin' Boxer", "Comics Hero", "Dark Scorpion", "Flower Cardian" "Warrior", "Six Samurai", "Ninja", "Heroic", "U.A. ", "Gouki", and "Noble Knight" archetypes are all Warrior-Type monsters, as is most of the "HERO" archetype. Warriors also have their own Structure Decks, Structure Deck: Warrior's Triumph, Structure Deck: Warrior's Strike/Warriors' Strike Structure Deck, Samurai Warlords Structure Deck and Structure Deck: HERO's Strike/HERO Strike Structure Deck. 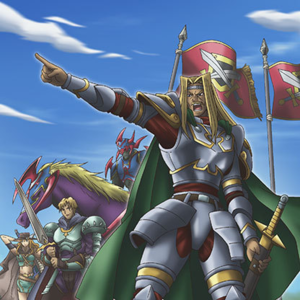 Most of the main protagonists of the series have used plenty of Warrior-Type monsters in their Decks, initially including at least 1 Warrior-Type archetype each. Yugi Muto uses the Three Musketeers of Face Cards and "Gaia The Fierce Knight" monsters, Jaden Yuki uses "Elemental HERO" and "Masked HERO" monsters, and Yusei Fudo uses "Warrior" Synchro Monsters. Yuma Tsukumo also uses several Warrior-Type monsters, with his signature monster also being Warrior-Type. Yuya Sakaki used the Type the least, his line-up consisting of "Performapal Helpprincess" and "Performapal Dag Daggerman", while Yusaku Fujiki only uses Cyberse monsters, but uses the Warrior-like "Code Talker" monsters and "Linkslayer". Many other characters use Warrior monsters, including all incarnations of Aster Phoenix, Reginald Van Howell III, Kaze, Nistro, Alito, Yuto, Chojiro Tokumatsu, Gloria Tyler, and George Gore. Warrior-Type monsters have a vast pool of monsters to choose from. Their varied and versatile strategies make them arguably one of the best Types. A Warrior Swarm Deck is a rather old deck type that was popular back in the days of mass destruction cards like "Raigeki". With one's field constantly under threat of being wiped, it was naturally an advantage to be able to return to numbers as quickly as possible, and while you had the chance to grab for as many Life Points as you possibly could. This deck's main power is rushing the field with 2 "Marauding Captain's", making your opponent unable to attack you. This combo was particularly deadly with "United We Stand", and if monster removal was available (such as the extra summon of "Exiled Force" through "Marauding Captain"'s effect), then it was a direct hit to the opponent. Alternatively, 2 "Command Knight"'s can create a lock that will prevent an opponent's monsters from attacking you directly. Additionally, if you place another Warrior monster such as "Twin-Sword Marauder" onto the field it will gain a substantial ATK boost and become an even greater beat stick. "Mysterious Guard" can also be used to ward off opposing monster(s). Having "The A. Forces" will allow you to make your lower level monsters harder to defeat in battle. If done correctly, it is possible to summon 5 monsters in one turn. By using 2 "Marauding Captain"'s on the field (locking attacks), a "Command Knight"(s) and "The A. Forces" makes a devastating combo of low level monsters, leaving you able to use the various Effect Monsters at your disposal. 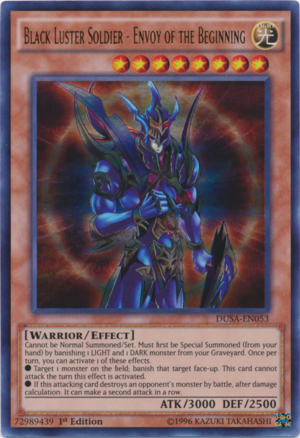 "Soul Charge" is a also a great card for bringing back legions of Warrior-Type monsters to regain/maintain field advantage. A Warrior Toolbox Deck revolves around the principles of searching out a Warrior "tool" to counter almost any move your opponent may put into play. Sometimes, this deck is referred to as merely "Toolbox". Today, Warrior Toolbox still thrives and remains a popular and powerful deck type. This deck type revolves almost completely around loading the deck with utility monsters, cards such as "Goblin Attack Force", "Mystic Swordsman LV2", "Exiled Force", "D.D. Warrior Lady", "D.D. Assailant", "D.D. Warrior", "Don Zaloog", and sometimes even "Elemental Hero Wildheart", "Bull Blader", "Mataza the Zapper" and "Twin-Sword Marauder". The reason for this is that the majority of these cards have a limited use outside of specific situations. Toolbox survives and thrives in today's metagame because it is able to reliably search the monsters it needs when it needs them to suit any situation. Most of this searching is done via "Reinforcement of the Army", "Last Will", "Witch of the Black Forest" and "Sangan", but occasionally Toolbox will utilize cards such as "Giant Rat", "Field-Commander Rahz" or "Mystic Tomato" due to the fact that a large majority of its cards may be tutorable by those monsters (including many non-warrior monsters which are seamlessly splashable in the Toolbox deck). Since "Last Will" is currently on the Forbidden list, "Freed the Matchless General" would be an ideal addition to any Advanced Format Warrior deck. Rat Toolbox refers to using "Giant Rat", and the elements of a Warrior Toolbox. It has a number of variations (the most popular being "Card Trooper" Return) and is, as of now, the most popular toolbox. The general aim of a "Ratbox," as it is nicknamed, is to special summon appropriate monsters at appropriate times, through the destruction of "Giant Rat". To speed this along, rush cards can be implemented in the Deck design, as well as Swap Control. It is probable that the best monster, besides "Giant Rat", in the Ratbox is either "Exiled Force" or "Card Trooper" and "Bazoo the Soul-Eater", depending on the design. Cards like "Nimble Momonga", "Elemental Hero Wildheart", and "Neo-Spacian Grand Mole" are important to the Deck as well. To ease the tension of drawing situational cards at bad moments, "Card Trader" is another good card for the Rat Deck. This common form of a Warrior Deck revolves around using Equip Cards to quickly overwhelm even your opponents strongest monsters with normally weak monsters. A great combo is to summon "Gilford the Legend" while you have "Gearfried the Swordmaster" on the field. If you do this while you have five equip cards in your Graveyard you can wipe out all of your opponents monsters AND inflict massive damage! Other good cards to add to this deck are "Megamorph", "Armed Samurai - Ben Kei", and "Mage Power" (Especially if you have a lot of Equip Cards). But an important thing to remember is to add cards like "Ultimate Offering", "Double Summon", and "Mausoleum of the Emperor", to maintain field advantage, because if you can't keep a couple of monsters on the field all you will have is a bunch of useless stuff. Some viable Synchro Monsters for this type of Deck are "Power Tool Dragon", "Seven Swords Warrior", and "Colossal Fighter", though one would need to include a Tuner monster such as "Tune Warrior" to utilize any of them. A more effective Tuner monster for this deck would be "Comrade Swordsman of Landstar" and it's effect would prove useful to any one using a Warrior-based deck. "Iron Blacksmith Kotetsu" is great for grabbing a quick and easy "Mage Power" or "United We Stand". "Fairy of the Spring" is a great way to recycle an Equip Spell Card. You may also look to Gemini warriors to aid your Warrior deck by adding a few Gemini monsters abilities running mostly equip cards and there trap card effects to keep your monsters safe and playable. First we look to the equip effect monster "Evocator Chevalier", now you "must" have all three of these monsters because they have an important effect that will destroy any card on the field if you send one equip card you control to the graveyard. "Phoenix Gearfried" has an ability that can special summon Gemini monsters from your graveyard whenever your opponent activates a spell card and also by sending one equip card to the Graveyard you can negate the activation of a Spell or Trap Card that targets a monster and destroy it. "Featherizer" will allow you to discard any Gemini monster in your Deck to the Graveyard and draw a card, this works well with "Phoenix Gearfried" or "Evocator Chevalier" as a last resort. Combo their abilties with "Sword Hunter's" ability so you will not always have to rely on your own Equip cards. "The Creator" is a great way to get rid of your "Phoenix Gearfried" that may be sitting in your hand so you can special summon him at a later time and possibly pull out whatever Gemini monster that may be in your graveyard.If you run one "Gearfried the Swordmaster" he can destroy one monster with every Equip Card that he is given. "Gilford the Legend" is a great way to recycle your Equip Spell Cards that have been used throughout the duel giving your "Phoenix Gearfried" "Gearfried the Swordmaster" and "Evocator Chevalier" a chance to further use their effects. "Field Commander Rahz" can be used to rig a level four or lower warrior draw that you may need,like a Gemini warrior,"Gearfried the Iron Knight" or "The Creator Incarnate" to get that Special Summon you may need for "The Creator". "Gemini Scorpion" is warrior monster that can special summon a Gemini monster from your hand. This can set up for an easy xyz summon such as "Number 39: Utopia" which is also a warrior monster. "Hidden Armory" is useful to get a specific Equip Spell Card from your Deck. "Supervise" is a card that will give your Gemini monster its effect and if it has been sent from the field to the graveyard you can select one Gemini monster from your graveyard and special summon it into play. "Divine Sword - Phoenix Blade" will combo very well with the effect of "Evocator Chevalier" which will allow you to use his effect multiple time in the duel at the cost of removing two warrior monsters from the game and you can force the effect of the equip card even faster using "Field-Commander Rahz". You can use "Kunai with Chain" to either switch your opponents monsters to defense mode possibly taking advantage of their weak defense or you can equip your weaker monsters possibly surprising your opponent by destroying your opponents monster that has a weaker attack. "Blast with Chain" effect will ether powering up your monster for five hundred points or by destroying it to use its secondary effect destroying any card on the field. "Gemini Booster is also another trap card that can become an equip card. You can also use "Return from the Different Dimension" together with "Divine Sword - Phoenix Blade" to return warriors that were removed from the play to launch an attack after utilizing "Evocator Chevalier"'s effect of destroying your opponent's cards on the field. This focus on Synchro summoning "Nitro Warrior" or "Turbo Warrior" on the first turn. To do this, you need to activate "Foolish Burial" to send "Nitro Synchron" or "Turbo Synchron" to the graveyard and activate "Junk Synchron's" special ability to special summon "Nitro Synchron" or "Turbo Synchron" from the graveyard and sacrifice "Junk Synchron" to special summon "Turret Warrior", and Synchro Summon "Nitro Warrior" or "Turbo Warrior".